We’re in recovery mode here in Áiseanna Tacaíochta (ÁT) after a brilliant day at our event, A Declaration of Independence: The First Assembly, which took place last Saturday, 13th June. 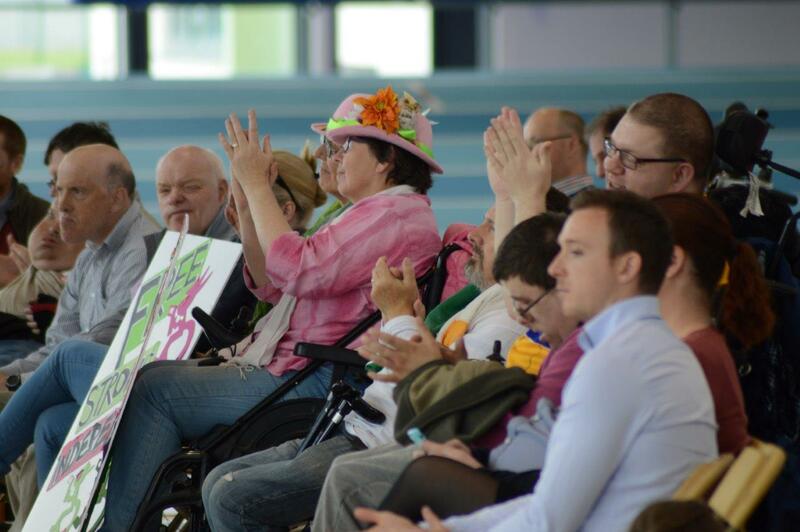 The International Arena in the Athlone Institute of Technology (AIT) played host to a great day of celebration, festivity and empowerment which brought hundreds of people wtih disabilities, along with families and friends, together in the first major national gathering of its kind. We got some great coverage of the event in the Irish Examiner and the Irish Times – just follow the links below to find out more. In this opinion piece in the Irish Times, our Director, Martin Naughton, explains the significance of the Assembly event and encourages a seismic improvement in the way we support and fund disability services, so that people with disabilities can be empowered to live full, independent and equal lives. He shows how our model of Direct Payments represents one of these innovative support solutions. “One of the main reasons for coming together in Athlone is to re-awaken and re-invigorate a new leadership among people with disabilities, especially younger groups. Years of austerity and cutbacks have silenced and weakened us because of the focus we have had to put on just surviving, on fighting to maintain often very basic rights. But change – the critical, momentous, game-changing progress we all need – won’t, and can’t, happen in silence”, he writes. Kelly O’Brien, a journalist with the Irish Examiner, joined us at the Assembly event in Athlone. She spoke to Martin about the day and about the change that Direct Payments can make in the lives of people with disabilities. Click here to read the piece and to watch Martin’s interview. Kelly also spoke to our Leader, Johnny Ryan, about his experience with Direct Payments. He spoke powerfully, explaining that “I have so much more independence now and so many more goals to achieve and so much more understanding of my own worth and my own abilities” now that he chooses and manages his own supports. Click here to read the article and to watch Johnny’s interview.